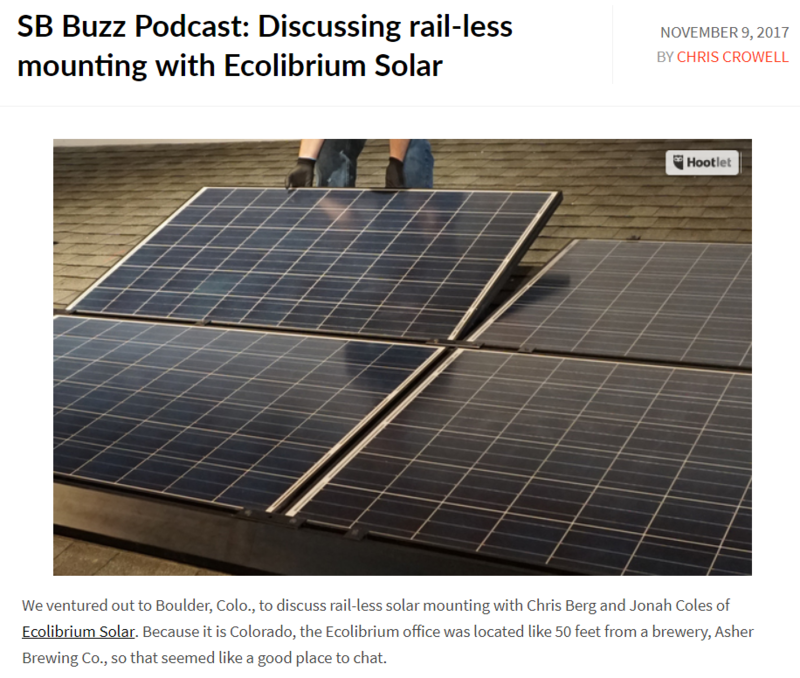 Recently, Solar Builder Magazine Editor Chris Crowell came to Boulder to talk with Ecolibrium Solar's Engineering and Product Solutions Managers Chris Berg and Jonah Coles. The resulting podcast, produced over a craft beer at next-door Asher Brewing, covers the UL2703 testing lab at Ecolibrium's Boulder facility, why rail-less racking will continue to gain ground as the racking of choice for installers, and myths about rail-less. During the onsite visit, Solar Builder Magazine's Crowell toured the Boulder facility, which is a certified UL 2703 testing partner lab of TÜV Rheinland Group, exploring why in-house testing speeds product development. In addition to testing prototypes, the company tests to qualify PV modules with their racking, according to UL 2703 standards. Ecolibrium Solar has added about 109 modules to their UL 2703 certification in the last 6 or 7 months. The listings enable customers and plan reviewers to see if the module specified is approved with EcoX Rail-less racking. “It’s a pretty big deal,” says Berg. And, Coles adds, it makes the inspection process go smoothly and quickly. Coles says there is a short transition period in which installers learn a new process. Once over that initial learning curve, “by the end of the month they won’t want to go back,” says Coles. One of the main differences between rails and rail-less is how wire management is done and the amount of time installers spend on the roof. There is also the benefit of eliminating the rails, which decreases the shipping and logistics of not transporting and cutting 20’ rails to the roof, and it’s faster to install. “Now we have customers who are doing two or three jobs in a day,” adds Berg. When asked about the myths that surround rail-less racking, Coles says the perception is that rail-less is not as strong without the rails underneath. Another myth Coles dispels is that rail-less is only good if you have a perfect rectangle. -Understand the type of attachment you need for different roof types, from metal to tile, and confirm the racking has the attachments needed for the installation. -Look for racking systems that don’t require reaching over the module. EcoX Rail-less Racking has a hold-open feature, so once the clamp is tightened and the module is dropped in, the installer doesn't need to reach back over the module to tighten the clamp. The module is already secured. This is a significant safety feature, as well as an ergonomic and ease of installation feature. -Buy a system that accommodates a wide range of module thicknesses, which range from 32-50 mm. -Check that the racking has been tested with the module you are going to use. This prevents delays in permitting or inspections in your jurisdictions. “The trend is that jurisdictions will require UL 2703 compliance. People aren’t going backwards, they are going forwards in requiring standards and UL2703 is the standard,” says Coles.